Where does pasta come from? No, it wasn’t brought from China by Marco Polo in 1292, as the story goes. Pasta, as a cooked paste made of flour and water, may have originated in Persia and migrated throughout the Middle East along with Arab traders. 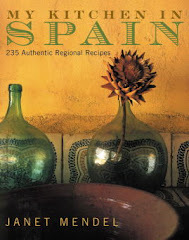 Although the Romans had some sort of pasta, it was Moorish invaders who introduced hard durum wheat to Sicily—a toehold in Italy—and to Spain. Pasta in medieval times wasn’t made in the varied shapes and calibrations that we know today. 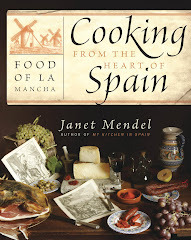 It was more like a poor folks’ stand-in for bread—unleavened balls of dough, hand-rolled and dropped into the cooking pot. 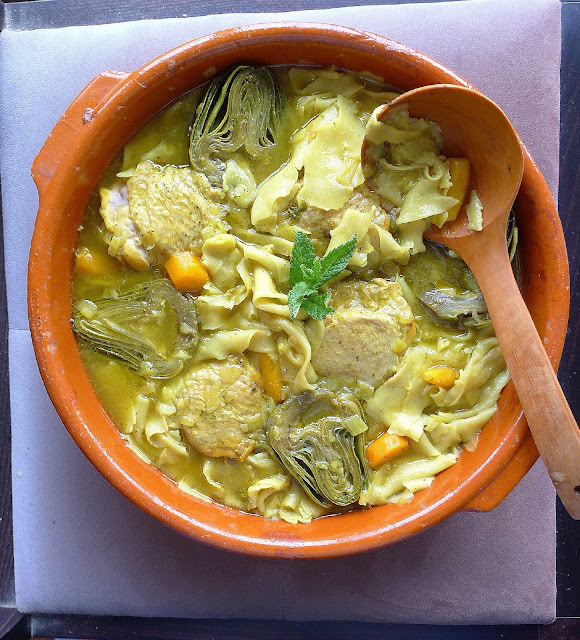 Pasta "rags" cook in a stew with chicken and artichokes. 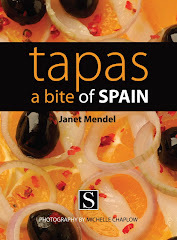 Spain’s traditional cooking still has some of those kinds of pastas. This is one, andrajos, which means “rags,” so-called because the cooked pieces of pasta look like tattered old clothes. 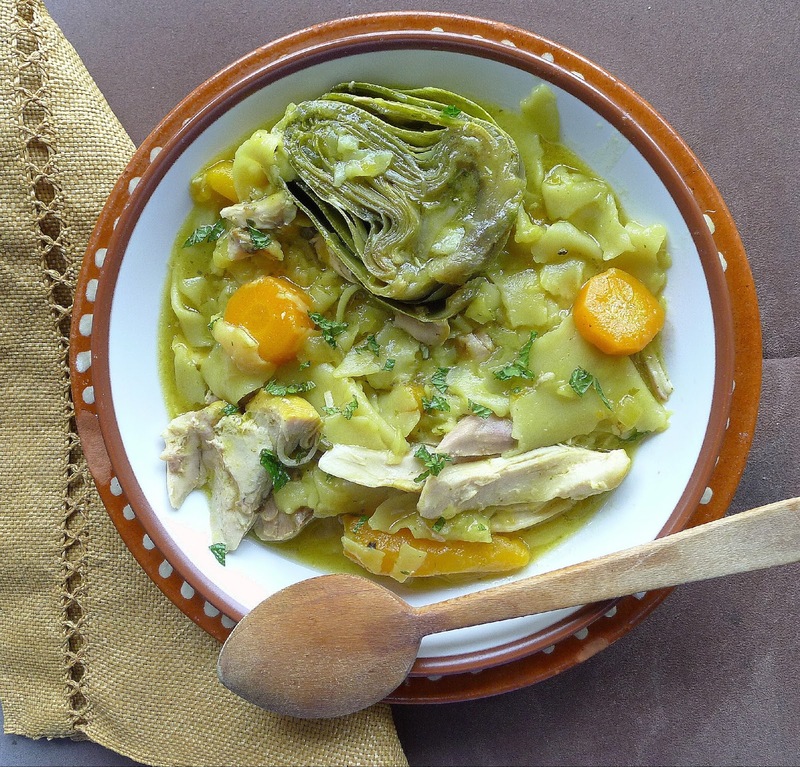 Originally it was a simple soup made by field laborers, consisting of foraged vegetables and greens stewed with garlic and olive oil to which hand-made pasta was added. Filling and sustaining. If hunters supplied rabbit, hare or partridge, meat would be added to the pot as well. Shepherd’s might have added pieces of lamb. 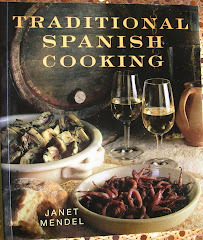 On church days of abstinence, the stew is cooked with bacalao, salt cod. Today andrajos is made with chicken. Pasta soaks up the savory liquid and thickens the stew. Knead to make soft dough. Place the flour and salt in a bowl. Add 1/3 cup of water and mix until all the flour is dampened. 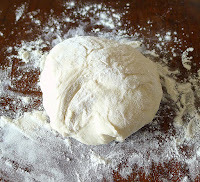 Add enough additional water (approximately 2 tablespoons) to make a soft dough that can be formed into a ball. 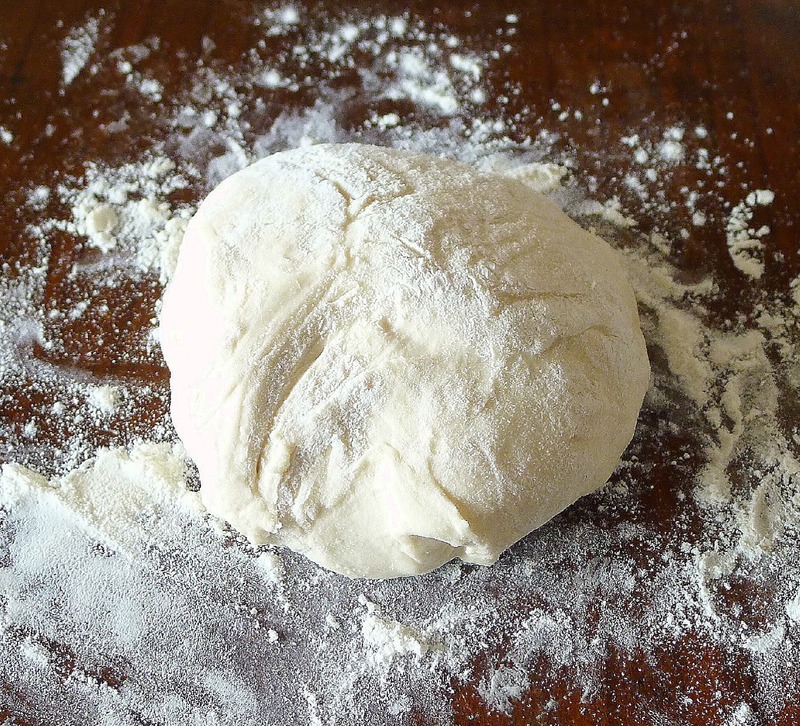 Turn the dough out on a lightly floured board and knead it until smooth and stretchy. Cover with a cloth and let the dough rest for 30 minutes. Divide the dough into 4 equal pieces and roll each into a ball. On a lightly floured board, roll out each ball of dough as thinly as possible into a disk approximately 9 inches in diameter. 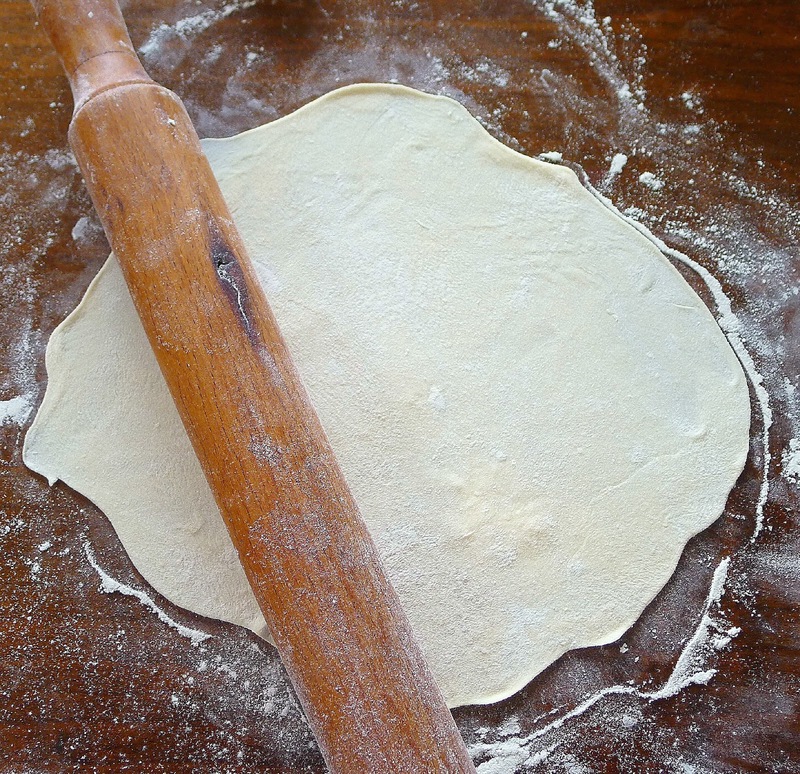 There's no need to make perfect circles, as the pasta will be broken up in cooking. Place the disks on a clean cloth until ready to add to the chicken stew, at least 1 hour and up to 24 hours. Saffron gives the broth a golden hue. The stew is easier to serve if chicken skin and bones are removed. The chicken thighs can be left whole or, for easier serving, stripped of skin and bones and the pieces returned to the pot with the pasta. 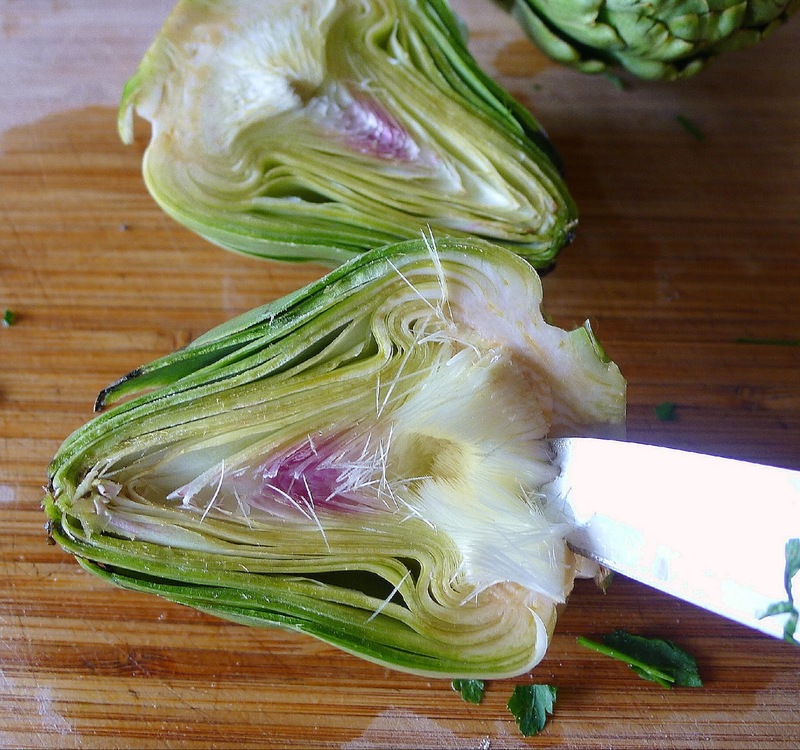 Trim the artichokes and add them to the pot immediately, so they don’t need to be soaked in acidulated water. To eat the artichokes, pick them up by the tips and bite off the meaty heart, discarding the leaves, or use a knife and fork to separate the heart from the (inedible) leaves. Frozen artichoke hearts can be used or substitute another vegetable such as chard, asparagus or fava beans. Sprinkle the chicken thighs with salt and pepper. Let them come to room temperature. Heat the oil in a heavy pot. Brown the chicken pieces slowly, 10 minutes. Add the onion and carrot and continue sautéing until onion begins to brown. Crush the saffron in a mortar with the peppercorns, clove and coarse salt. Scrape it into a blender with the garlic, parsley and cumin. Add ¼ cup of the water and blend until smooth. 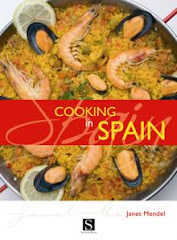 Add the spice mixture to the pot with the remaining 6 cups of water and 1 teaspoon more of salt. Add the sprigs of thyme, mint and bay leaf. Bring to a boil, then simmer, covered, 30 minutes. Cut out the fuzzy choke. Cut away artichoke stems and snap off outer leaves. Use a serrated knife to cut the artichokes in half. 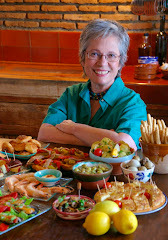 With the tip of a knife, cut out and discard the fuzzy choke. 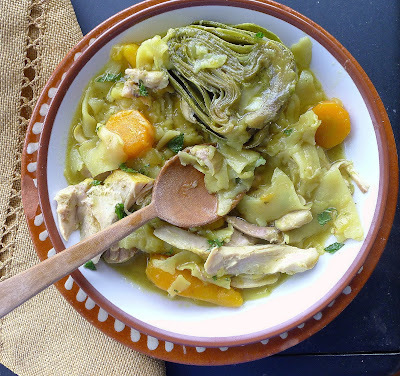 Add the cut artichokes immediately to the pot with the chicken. Continue cooking until artichokes and chicken are tender, 30 to 40 minutes more. Put disk of pasta into bubbling liquid. 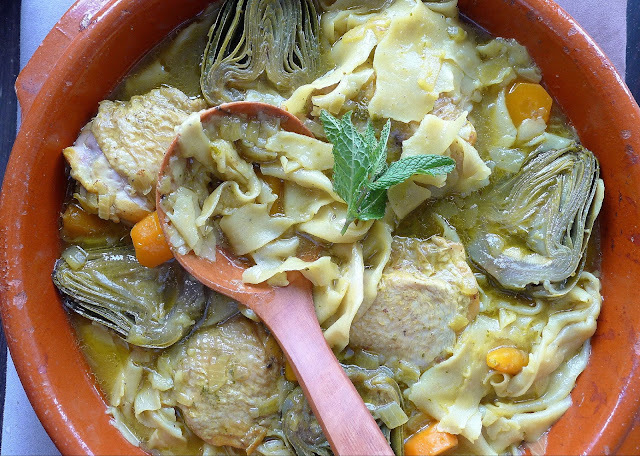 Remove chicken pieces and artichokes to a serving bowl. 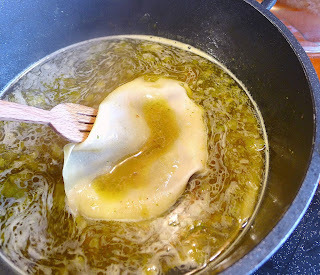 With the remaining liquid bubbling, place one of the pasta disks into the pot. Gently push it down with the back of a wooden spoon. Add a second pasta round in the same manner, then the remaining two disks. Use two forks to tear the pasta into raggedy pieces. Let it cook until tender, 10 minutes. Remove and discard skin and bones from the chicken. 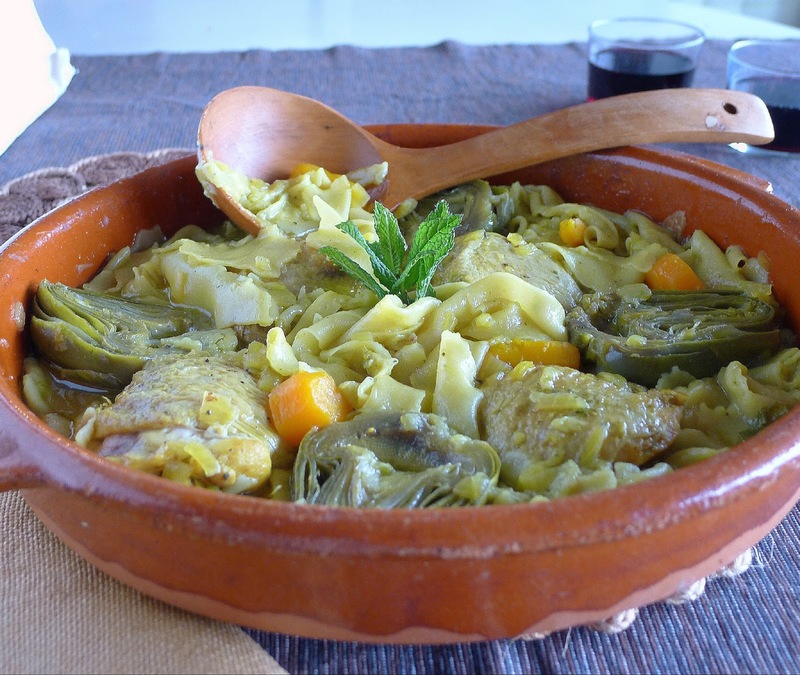 Return the pieces of the meat to the pot with the artichokes. Reheat. Serve the stew with chicken, artichokes and pasta rags sprinkled with chopped mint. Chopped mint enhances the flavors of this stew. Penne with Sofrito and Chorizo. Noodles with Seaweed and Squid.